﻿Professional, crisp, tailored, stylish but not flashy, attractive but not sexual, demonstrating confidence but not cockiness. Many lawyers, when getting dressed in the morning before a significant meeting or court appearance, take a breath, look in the mirror and wonder if they’ve achieved the best look possible for the day ahead. Confidence is often based, in part, on both how we look in our professional garb and also how we feel in our clothes. If your tightly collared shirt cuts off your air supply in the middle of a closing argument, that’s not a good thing. Likewise, if you show up at a marketing lunch to woo your dream client and your dress is seven years old, a bit tight and quite out of style, the potential client will get an immediate negative impression, and you may be unable to seal the deal. So fashion is important! In this article, I feature a bit of my own fashion philosophies and also focus on four snappy Seattle lawyers who were willing to strut their stuff for the Bar Bulletin: Irene Leonard, Jeremy Yates, Jerilynn Gonzales and Mike Longyear. I have always disliked wearing jackets. To me, jackets feel very restrictive and a bit unfeminine. Other women wear jackets and look great! But it’s just not reflective of my personal style. So, I usually strive for a flexible and professional look, while avoiding a jacket. This combination works well for me in several respects. The white top is simple and comes from White House Black Market. It’s very comfortable, yet professional. 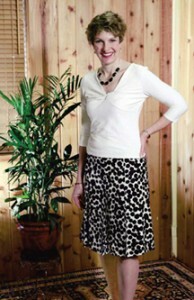 The skirt is silk and comes from Banana Republic. I especially like the black-and-white polka dots because they’re fun and add a bit of personality. I also like the pleats. I rarely go to court and my days tend to be varied. On a typical day, I might attend a networking lunch, such as a Women Business Owners lunch at the WAC. And I may have meetings with varied clients. For example, I may meet with an older couple who need assistance with estate planning, and then with a group of 20-something guys, all wearing jeans and stocking caps, who are starting a high-tech business. Then, since I’m newly single, I may round out my day with a date! This outfit is very flexible, and works for all of it. It’s professional enough so that the older estate-planning clients feel comfortable. It’s not stuffy, so the 20-somethings will also feel at ease. And, it easily goes from day into evening. Most importantly, I feel comfortable and confident in it. To me, a well-dressed lawyer looks professional, while sporting a look that reflects his or her own style and personality. That’s what makes dressing for work fun! When Stacey asked me whether I wanted to pose for her “People” article, I was torn. The extrovert in me said “yes” and the shy person said “what are you crazy! You take terrible pictures.” The extrovert won. I decided to take advantage of an opportunity to get dressed in business attire. I don’t get to wear business attire very often as an executive business coach for lawyers, and who works out of her home and on the phone. Every day is casual Friday for me unless I am meeting with a client, attending a networking event or giving a presentation. Then I have the pleasure of dressing up. I’m actually one of those people who likes wearing business attire. Choosing the business outfit for this article was harder than it would have been when I was general counsel and working downtown. I enjoyed having a large number of wonderful business outfits then. With spring around the corner, I chose to wear a melon-colored, two-piece (no blouse) suit. I prefer wearing a skirt, because that works best with my petite frame. I’ve always worn suits that are more distinctive and stylish than the traditional blue suit (although I wear those, too). I love quality and a good bargain, especially when they come together in a great suit, and this was one I purchased at Macy’s. My shoes are Italian leather that I purchased in Vancouver, Canada. Turns out I had fun posing for the pictures and felt great wearing my outfit. Usually, I wear the customary suit and tie when I meet with clients. But when I know a client well enough, I like to shed the coat and tie and really shock them with a hard-hitting metro shirt and Dockers. It strikes me that this is often preferred by my younger clients or a tech crowd that dresses down on Monday through Thursday and wears swim trunks on Friday. (I’ve been told by IP friends that showing up at a tech client’s office in a tie is a NO-NO!) Now mind you, this shirt is the only stylish shirt I own, and I didn’t buy it, my wife did. So, if I look decent, it isn’t my doing. I like the black, gray and brown striped shirt because the vertical lines blend seamlessly with tall buildings and add to, rather than detract from, surrounding architecture. This shirt goes with anything, which means no matter what pants I put on, I can’t screw up. That is a major theme in my low-risk wardrobe. “First, do no harm.” If I manage that old maxim in my work attire, I feel like a fashion success. As with all of my business attire, I accessorize with sideburns. Appropriately, I started growing my burns in the late ’70s, when I was 2 or 3. The burns really came into their own in college, and for a solid five years now in the legal community, no law professor, senior partner or member of the judiciary has suggested I drop them. Currently, my boss says they’re downright great. That’s one advantage of practicing solo. Even though my office is business casual, I still consider this suit to be one of my favorite work outfits. This is one of the first suits I ever bought and I found it on sale in New York City the summer before my 1L year of law school. The suit has special meaning because I wore it for law school Moot Court competitions that I did well in, and I have also worn it for interviews that went pretty well. I’m superstitious, so the suit is kind of a good luck charm. But this suit also has been through, and survived, some rough times. One winter evening during my 2L year, I was leaving school after having worn this suit for a Moot Court competition. A group of my friends were in a car waiting to give me a ride and I started picking up my pace toward the car. I’m usually pretty coordinated, but for some reason (I’ll blame it on a mix of the ground being wet and my huge backpack being filled with books throwing off my balance) I slipped and fell really hard onto the ground about 10 feet from my friend’s car. As I truly felt like I was moving in slow motion, my knee hit the cement first and I proceeded to splay forward, where I basically belly-flopped onto the ground. I was so shocked that I completely bit it, but I couldn’t help but laugh. And my friends thought it was hysterical, too. It was a fairly bad fall, because my hands and knee got a little bloody, and I even had some gravel and dirt in my fresh “battle wounds.” The ungraceful fall left a hole in the knee of my suit, which I have since gotten patched up. But you can still see the battle scar if you take a close look at the suit. For all of these reasons, both sentimental and silly, I would have to say that this is my favorite work outfit. “Keep it simple” is my thought when it comes to being a lawyer and men’s fashion. Have a few classic standard outfits for the courtroom; suits in blue, gray and maybe a pinstripe; for days in the office or meetings with clients go with a couple of comfortable jackets/blazers that are dark blue, brown and black; shirts in white and shades of blue and occasionally a check or plaid. Ties — dots and stripes with paisley for the days you want to be wild. Shoes — get something easy on your feet when running to the courthouse for a TRO. Be comfortable and be low maintenance. If something is too fussy or fancy, it’s probably a fad and will look ridiculous soon. Casual Friday — don’t use it as an excuse to look like you are cleaning out the garage. Inevitably a client will show up or those jeans you thought you looked great in are just waiting for the next trip to Goodwill. What about sweaters for those cold days in the winter? Having been accused of looking like I was about to give an energy-saving speech like Jimmy Carter, being a ski bum or Mr. Rogers, I recommend a classic V-neck or crew collar. Closing argument: Don’t be a fashion victim; need I say more? Stacey L. Romberg, attorney at law, when not shopping for that perfect accessory, practices law in the areas of business law, estate planning and probate. She may be reached at www.staceyromberg.com.